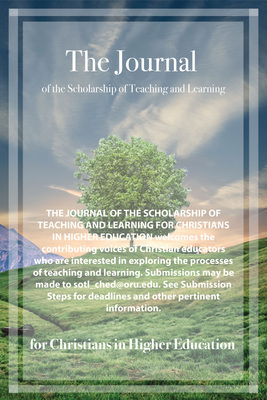 "Journal of the Scholarship of Teaching and Learning for Christians in "
The Journal of the Scholarship of Teaching and Learning for Christians in Higher Education welcomes the contributing voices of Christian educators who are interested in exploring the processes of teaching and learning. Submissions may be made to sotl_ched@oru.edu. See Submission Steps for deadlines and other pertinent information.